Jon made small talk with the shelter attendant as she led him through to the Cat Room, about how he'd just moved to the city, and he was liking it well enough so far, and sure, he would love to try that restaurant. He would have invited her to come to his show, but, well, he didn't exactly have a steady gig yet. Maybe next week. "To be totally honest with you, I'm more of a dog person," he admitted. "But I'm in this tiny rathole of an apartment, and it's not the greatest neighborhood for walking, and, you know, I just feel like I'm more at a cat place in my life." The Cat Room was shabby but loving, put together with obvious care for the animals even on an all-donation budget. Milk crates were nailed sideways to the wall, in a pattern perfect for climbing; a few of them were even currently being slept in. Wooden poles and tubes covered in mismatched scraps of carpeting showed the signs of gleeful tear from hundreds of claws. A row of food and water bowls stood along one wall; a row of covered litter boxes faced it. He was caught off-guard by a sharp, high miaou at his feet, and nearly tripped over the cat that had made it. When he stopped, this cat wound around and between his legs, mewing insistently some more. "That's his 'Friskies, please!' meow," the attendant said with a laugh. "Most of the cats pick up that we have a schedule for treats, but Stephen here expects to be fed every time someone comes in." Jon crouched again to get a closer look. The cat -- Stephen, of all things (the cats on the shelter website tended to have names like Fluffy or Mr. Whiskers or Lord Clawsington) -- had brown fur with thin dark stripes, white front paws, and a wedge of white fur down his chest. And there was something up with his face. Not quite Grumpy Cat levels of distortion, but his golden-brown eyes did seem to be stuck in a permanent glare. "Sorry, buddy, no Friskies right now," said Jon. Stephen sniffed, unimpressed, and butted his head with surprising force against Jon's knee. "How about petting? Would you settle for petting?" Jon ruffled the fur on Stephen's head. The cat's right ear, he noted, was cut or torn shorter than the left. "What happened to his ear? Was he in a fight?" "This one does get in plenty of scuffles, but the ear was us," explained the attendant. "There's not enough shelter space for every stray, so we try to neuter and vaccinate as many as possible, then clip their ears before releasing so we know not to try to catch the same cat twice." "But you kept him anyway." Stephen was now rubbing his face all over Jon's hand and wrist. "Did they mess up your handsome looks for nothing, boy? No wonder you look so grouchy." The attendant shrugged. "Sometimes we end up bringing them in if they're injured, or not getting enough food on their own. It happens a lot with house cats that get abandoned or lost." 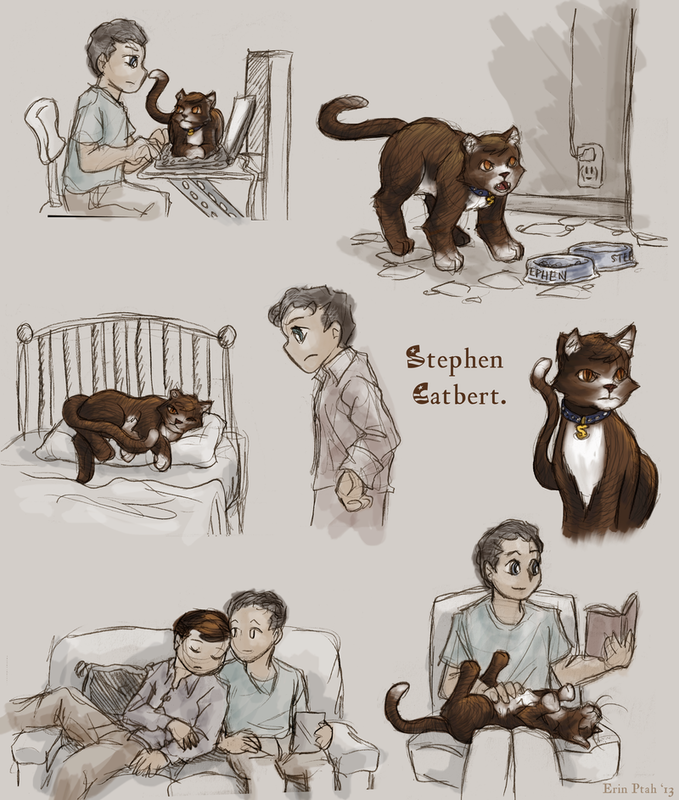 Experimentally, Jon scooped Stephen into his lap. The cat promptly started headbutting his chest, and didn't let up until Jon redoubled his skritching efforts. You'd think a dumped house pet would be more skittish, but apparently this one had decided only other cats were his enemies. Humans were for demanding attention from. "Yes, you're a good boy," soothed Jon as Stephen glowered at him, as if to warn Jon that there would be consequences if he stopped the petting. "You want to come home with me, huh? No other cats around to get in your way, and I will spoil you with Friskies." Still glowering, Stephen started to purr. Yeah, Jon had found his cat.